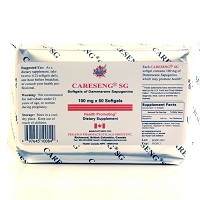 Careseng® SG contains 100 mg of Dammarane Sapogenins (Aglycon Sapogenins or AGS.) This formula is for use in the body other than the brain. Other ingredients are Ethanol, Mid-Chain Triglyceride, Vegetable Oil, Gelatin, Glycerin, Distilled Water. These products contains specially concentrated R- family ginsenosides which are types of aglycon sapogenins (AGS.) Although they are derived from Panax ginseng, they have special properties of their own and are extremely concentrated in this product. 80% of the ginsenosides are aglycon sapogenins and ginsenoside Rh2. Preclinical studies show these compounds may contribute to normal cellular health. This product is shipped in the USA and Canada by express mail for faster service. Note: Order a month supply and you can get 5% off and free shipping. Do not use if pregnant or nursing without a physicians approval. The aglycon sapogenins are nontoxic. This product and protocol are part of a complete regimen and should be used under a physician's supervision. Not recommended for individuals under 21 years of age. It should not be taken with MAO inhibitors or with warfarin. Physician monitoring is important if hypertensive. Take 12 capsules (1200mg) per day with warm water for a consecutive of five days in a week for four weeks continuously. Depending on individual’s situation, may take continuously for up to twelve weeks or longer. • Three times daily with 1-hour intervals. Two hours after meal, take 4 capsules each time. 􀂾 Evening plan: If take dinner at 5pm, then take 4 capsules each time at 6pm, 7pm and 8pm respectively. • For those who tolerate well, may either combine morning and afternoon plans, or combine afternoon and evening plans. Total six times daily, 24 capsules (2400mg) per day. SomatoPlex is an Advanced Anabolic Formula hGH releaser. Products made with GSE may be substituted for more toxic household products available from grocery and drug stores. Andrographis is a promising new herb which may be of benefit in many health conditions. The "vine that ate the south" can also be eaten, the better for your health.